Always alert to the possibilities of novel arrangement in composition Degas found an unusual suggestion for the asymmetrical design he favoured in a turn at a circus in which space also took a new aspect. 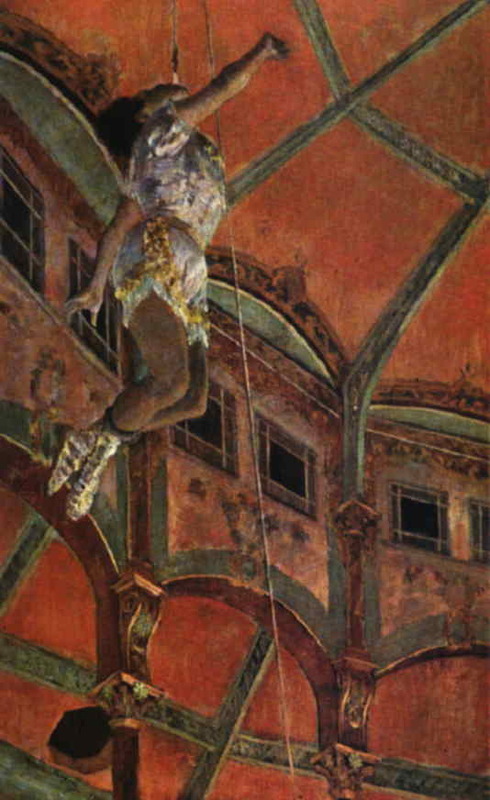 The painting was shown in the fourth Impressionist exhibition and described in the catalogue as Miss Lola au Cirque Fernando , though contemporary reference has since proved that the performer was in fact known as Lala or La La. She appears to have been a negress or mulatto noted for such feats as that shown in the picture where she is being hauled to the circus roof by a rope held between her teeth. The circus was in Montmartre and later became known as the Cirque Médrano, long being a popular resort and sketching-ground of artists. Degas's investigation of how to give importance to the main figure when not centrally placed here takes a vertical instead of a lateral direction. The placing of the figure near the top of the canvas was obviously called for to suggest distance beneath. The sketch for the painting (in the Tate Gallery) shows only the performer's pose--the composition was worked out subsequently.